Neil Cole is a name I’ve known for quite some time. He literally wrote the book on “organic church”—a term that describes the journey I’ve been on for almost four years now. But until recently, I’d never actually read one of his books. I’m happy to say that’s no longer the case. His latest book, Primal Fire, is about the five roles listed in Ephesians 4:11—apostle, prophet, evangelist, shepherd, and teacher (or APEST for short). And while APEST is his focus, he covers much more than these specific callings. The book was thoroughly enjoyable from cover to cover. I agreed with just about everything Neil had to say. Because of this, I’m going to get my one disagreement out of the way before covering the many things I loved about the book. And when it comes down to it, our only major area of disagreement is a matter of semantics. Neil consistently refers to APEST as five gifts of the spirit. However, I see them as being five roles that God calls specific believers to fill. The Bible never refers to any one of them as gifts. Prophecy is certainly called a gift, but having the gift of prophecy does not make one a prophet. The same can be said for the gift of teaching, which does not make one a teacher. The Bible never explicitly calls apostling, evangelism, or shepherding gifts, but even if they are gifts, having them does not make one an apostle, evangelist, or shepherd. Rather, APEST are roles within the church, but any person in the church—regardless of which role(s) he or she fills—can exhibit any of the spiritual gifts as God grants them. Neil actually hints at this distinction on page 90, where he separates APEST from the spiritual gifts described elsewhere in the Bible. Nonetheless, he continues referring to APEST as gifts throughout the book. However, this really is a minor difference in semantics. His book does a great job describing the five roles, even though he calls them gifts. So I can’t complain too much. In the introduction, Neil talks about the church, and he summarizes the five roles. Apostles “are tasked with the overall vigor and extension of the church as a whole.” Prophets “are attuned to the voice of God and how we respond to Him.” Evangelists are “the primary recruiters to the cause of Christ, enlisting people into the movement by transmitting the gospel.” Shepherds “nurture the spiritual health and development of a loving community.” And teachers “convey wisdom and illuminate understanding of the revelation given to the church” (pp. xxi–xxii). In chapter 1, Neil shows how all five of these roles were present in Adam before the Fall. Then, in chapter 2, he shows how Jesus fulfils all five roles himself. “Jesus is the beginning and end of all we do” (p. 27). Chapters 9–13 each cover one of the APEST roles, dissecting and examining them in detail. Neil explains the function of each, and he demonstrates that their functions are not ends in themselves. Rather, they exist to equip others to do the same. He also shows the “shadow” cast by each role—the negative traits such people can sometimes tend to exhibit. And in chapter 18, Neil describes counterfeit versions of each role. As I mentioned earlier, this book covers much more than APEST. In chapter 3, Neil defends what he is perhaps best known for—an “organic” expression of leadership in the church. Some might be tempted to think he’s just using this as an excuse to ride his hobby horse, but they’d be wrong. A proper understanding of church leadership is foundational to a proper understanding of the APEST roles. The majority of the church today has adopted the world’s system of hierarchical top-down leadership, but that system is diametrically opposed to the model of service and submission that Jesus taught. Neil did a fantastic job of wading through this issue in a single chapter. Neil also spends a bit of time critiquing cessationism—the idea that God no longer gives certain miraculous spiritual gifts. Most cessationists also deny the validity of modern apostles and prophets, making this an important issue to address. In chapter four, he provides a brief overview of cessationism, and he defends the roles of apostles and prophets as being valid for today. In chapter seven, he launches into a more thorough discussion of spiritual gifts and what it means to be filled with the Holy Spirit. He starts off by saying, “No matter what your current understanding of the Holy Spirit, I can almost guarantee I’ll end up stepping on your toes here.” Ironically, this chapter was one of my favorites. The view he articulates is almost identical to view I already hold—even covering our need to “be being filled with the Spirit” (which is what inspired the name of my blog). There are many other wonderful things I could say about this book, but space does not permit me to write much more. 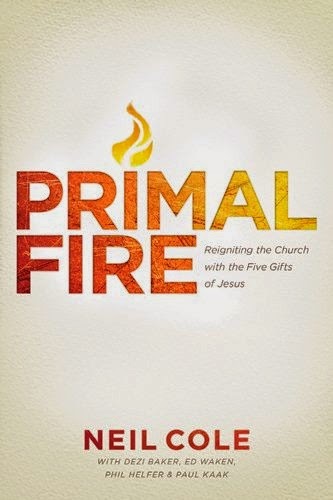 I wholeheartedly recommend Primal Fire: Reigniting the Church with the Five Gifts of Jesus. Despite a minor quibble over terminology, I love the way Neil has presented these roles, and the book itself was a joy to read. I’d like to thank the Tyndale Blog Network for sending me a copy to review. Pick up a copy for yourself as a paperback or a Kindle eBook. And let me know what you think of the book in the comments below!